Reading the Islington Daily Gazette and North London Tribune helps us to understand how the war was reported at home in Finsbury and Islington. It makes harrowing reading as we discover how little of the Finsbury Rifles’ suffering in Gallipoli is reported at home. Note: this is not accurate. There is no mention of the Finsbury Rifles landing at Suvla Bay. See the war diary entries for the 10th August 1915. ‘At Suvla the troops on the left flank made a short advance on the afternoon of the 15th with a view to straightening out the line. Note: There is a strictly censored version of this disastrous campaign, which led to the sacking of Frederick Stopford as Divisional Commander. The attacks by the Rifles, among other regiments, were initially successful but what is not mentioned is the regiment’s inability to hold onto the gained ground, due to a lack of support, and their heavy losses in the retreat. See the war diary entries for August 15th 2015. ‘Another dispatch with regard to the operations in Gallipoli has been received. It is of an encouraging character…. The recent operations on the Gallipoli Peninsula (says an official bulletin) consisted of attacks on the enemy’s position along the southern and Anzac lines, and included a fresh landing in strong force at Suvla Bay. There is evidence from prisoner’s statements that the Turks had been considerably reinforced with a view to heavy attacks, and that the Allies forestalled the enemy by about 24 hours. Consequently the fighting was very severe, and on the both sides the casualties were very heavy. The landing at Suvla Bay was well planned and carried out by the Navy, but in spite of the fact that the Turks developed their greatest strength in the ‘Anzac’ region, Allied troops from Suvla could not make very satisfactory progress before the enemy was able to move up considerable forces from his reserves and to bring further advance at this point to a standstill. Within the past week the positions won have been consolidated at all points. Note: This is the first extensive report of the landing at Suvla Bay. It seems written to keep up spirits at home, rather that report the realities of the campaign. I’m not convinced spirits would have been as excellent among the Rifles as was reported. There is no specific mention of the huge casualties suffered by the Rifles on the 15th – 18th August 1015. It seems that the first families waiting at home would know about these losses would be the telegrams arriving from the War Office. The paper publishes a speech by the Right Rev. Monseigner Groach calling for 500 more men to sign up to the Islington Battalion. Every man joining the Army brings victory nearer. ‘Just look at the mistakes that have been made; so-and-so should not have done such and such.’ If mistakes have been made, it is because mistakes must be made in all human things. The man who never made a mistake never made anything. Note: The Rifles among other battalions would certainly need more recruits after their heavy losses at Gallipoli. Note the plea to patriotism, freedom and justice. Conscientious Objectors are dismissed and criticised, their objection considered invalid. ‘The position in the Dardanelles is not quite so rosy as rumour would paint it, but nethertheless substantial progress is being made. Note: A small acknowledgement to the reality of the stalemate in Gallipoli. 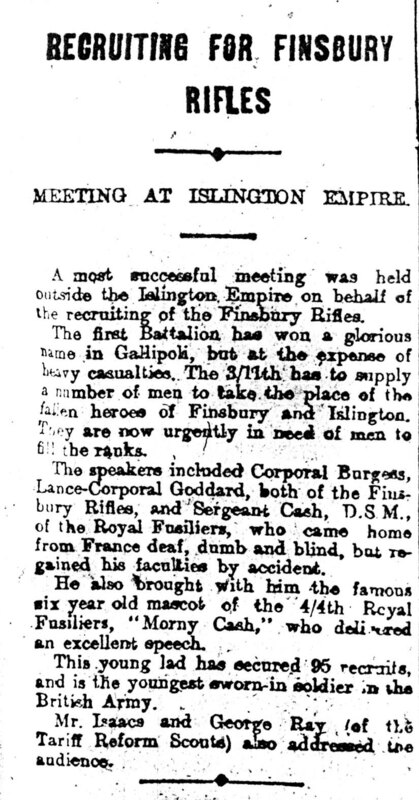 ‘A most successful meeting was held outside the Islington Empire on behalf of the recruiting of the Finsbury Rifles. The first battalion has won a glorious name in Gallipoli, but at the expense of heavy casualties. The 3/11th has to supply a number of men to take the place of the fallen heroes of Finsbury and Islington. They are now urgently in need of men to fill the ranks. The speakers included Corporal Burgess, Lance-Corporal Goddard, both of the Finsbury Rifles, and Sergeant Cash, D.S.M., of the Royal Fusiliers, who came home from France deaf, dumb and blind, but regained his faculties by accident. He also brought with him the famous six year old mascot of the 4/4th Royal Fusiliers, ‘Morny Cash,’ who delivered an excellent speech. Note: An acknowledgement of the huge casualties among the Rifles at Gallipoli but painted as a necessary sacrifice.